Who would deny the significance of flowers in the mode of celebration? I hope no one in this world. In all the moments to cheer with family and friends, gifts and goodies supports the events. And among all the gifts flowers have their own significance. 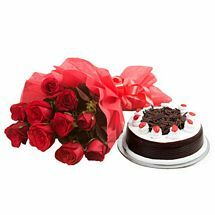 Flowers are no doubt the best means of representing sentiments, whether you want to confess love, want to say sorry or just want to say thanks to someone special, definitely there is nothing as special as flowers for the occasional gifting. Sometimes flowers are meant to cater a special occasion and sometimes it is not. For the flowers that meets with all the desires of all the special moments comes to the category of all time hits. Sometimes there is a reason for presenting flowers and sometimes there is not. For every occasion when you think flowers can make a difference in your relation you can present the same. We have brought you a huge array of flowers and flower collection, just as to make your special moment more special. Flowers are the most common gifts type. With us you can find flowers in different categories which include mixed flowers, flower hampers, flower combos, romantic flowers and artificial flowers. Roses, Lilies, Tulips, Orchids, Gerbera and Carnations are all what is in our list. Depending on your need and the peculiarity of the occasion you can pick flowers accordingly and Send Flowers Online to India at highly reasonable price and free delivery across the length and breadth of India.